An archaeologist has made the startling discovery of liquid mercury beneath an ancient pyramid in Mexico, which predates the Aztecs. This could mean the presence of a royal tomb right below one of the most cryptic cities in the Americas. Local researcher Sergio Gomez announced the discovery on Friday of “large quantities” of the element underneath the Pyramid of the Feathered Serpent – the third largest in the ancient ruined city of Teotihuacan, which is shrouded in mystery and was once one of the largest in the hemisphere. "It's something that completely surprised us," he told Reuters, standing at the entrance to the ancient pyramid, located about 30 miles (50 km) northeast of Mexico City. What makes the find more exciting is the city itself, believed to come from the same period as the great Mayan city-states, but even less explored – even its inhabitants have no name, and there used to be 200,000 of them, living amongst gargantuan stone pyramids some 1,300 to 1,900 years ago. Six years of work paid off when Gomez and colleagues managed to dig their way into an ancient tunnel discovered in 2003 that lay sealed all this time, closed off by the locals themselves. But it was only last year, after gathering substantial resources to carry out research at the highest level that the archeologist announced the discovery of three chambers almost 12 meters (39 feet) below the temple. Immediately they found objects of symbolic value – jade statues, jaguar remains and various hand-carved objects. The presence of the highly toxic, odorless liquid metal is peculiar, as ancient Americans had no use for it, but it was also discovered at three other ancient sites by a Berkley anthropologist – never in Teotihuacan. Gomez believes this signals the presence of a tomb. 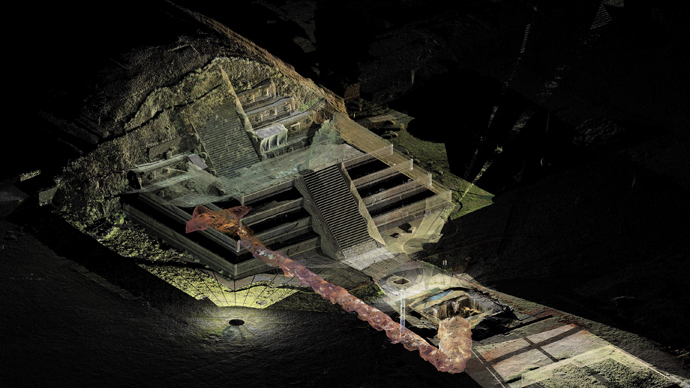 If that’s true, this is the first tomb found in Teotihuacan, following decades of exploration. His view is shared by some in the archeologist community, who believe mercury might have been used to symbolize an underground river. Mercury’s sleek look and reflectivity must have lent to its ritualistic use. "But it's still very uncertain, and that is what keeps everybody in suspense," another archaeologist, Geoerge Cowgill, told Reuters. He’s been digging in the ancient city for four decades now. Now Gomez and team are painstakingly exploring the three chambers, deep in the dank and humid corridors, wearing protective gear to shield themselves from mercury poisoning. Anytime now, Gomez expects to come across the elusive dead king. Mexican city-states are mysterious because little is known about how they lived, governed, or even how that governance had led them all to collapse onto themselves. Discovering a royal tomb in Teotihuacan would provide a major piece to that puzzle. The city’s name is translated as 'abode of the gods' from the Aztec language Nahuatl. Adding to its mysterious allure is the fact that, compared to the Mayans, this city-state left no written record. All that is known is it was different from the Mayans in a number of ways. But our knowledge only picks up somewhat after the 14th century, when the Aztecs came. Teotihuacan had been abandoned by its inhabitants long before then. One possible clue to the city’s past may have been given by Mexican archeologist Linda Manzanilla, who believes that in its heyday Teotihuacan was ruled by four lords – not one king. Gomez’s find could be the remains of one of them. The Spaniards got there toward the end of the 17th century, but proper research of the highest order did not start till the 1950s. We should get more answers when Gomez wraps up the dig in October, with an announcement of results expected by December.